French researchers investigating the famous Great Pyramid of Giza discovered unknown rooms. Using ground-penetrating radar systems they discovered evidence of the existence of secret passageways and a third chamber below and behind the the Queen’s Chamber. It all started when Gilles Dormion, who was joined later by Jean-Yves Verd’hurt, made some early probes in 1986 and 1998 using microgravimetry to measure the density of construction materials and clearly saw some possible evidence of Chambers around the Queen’s Chamber. The Japanese tried to follow up this research and confirmed a cavity a few meters wide. The French team and especially Dormion concluded that there had to be a trinity of burial chambers in the Great (Cheops) Pyramid. Egyptian archeologists are hoping that inside the chamber there may be a sarcophagus or even other tombs that will be found upon further exploration. There are already plans scheduled by the Chairman of Egypt’s Supreme Council of Antiquities (SCA), Dr. Zahi Hawass, for the further insertion of a Japanese-built remote- controlled robot which will be sent into the secret chamber. This may take place this year. Although the Academy and Dr. J.J. Hurtak, Ph.D. cannot confirm the details of this find until additional research goes through this year, a connection between three different chambers may emerge. In our public lectures, we have been following and reporting (e.g., Pretoria University, November 2005) on the research of Gilles Dormion and Jean Patrice Goidin who were part of the larger team that worked on the Great Pyramid’s ventilation shafts. What is exciting for Egyptian archeologists is the possibility of finding another tomb or sarcophagus. 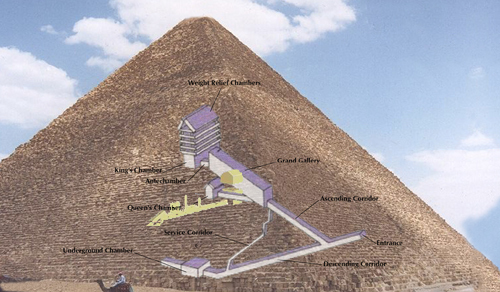 The Cheops (Khufu) pyramid is surrounded on the Giza plateau by many mastaba tombs, but no clear evidence of any bodies has been found at least in the major pyramids. There was some evidence that the smaller pyramid of Menkura did house a mummy that was stolen and the lost at sea. If this preliminary, significant finding is proven accurate of new rooms and extensive passages, this will point to a new chapter in Egyptology, remote sensing, and the understanding of our Higher Heritage. We appreciate your interest. The Academy is a nonprofit organization. Please consider making a donation through our secure web server or by postal mail. We are always happy to receive extra contributions because they help us maintain our work around the globe. Your support is absolutely necessary to continue to make this possible. You can always help — you can always pray.